"Tell me the difference between stupid & illegal & I'll have my wife's brother arrested." That funny quote from Ryan Gosling is not the only hilariously quotable line in The Big Short, which is not only the best film of 2015, but also one of the funniest. The film is based on the 2010 book of the same name by Michael Lewis, involving the financial crisis of the late 2000's. 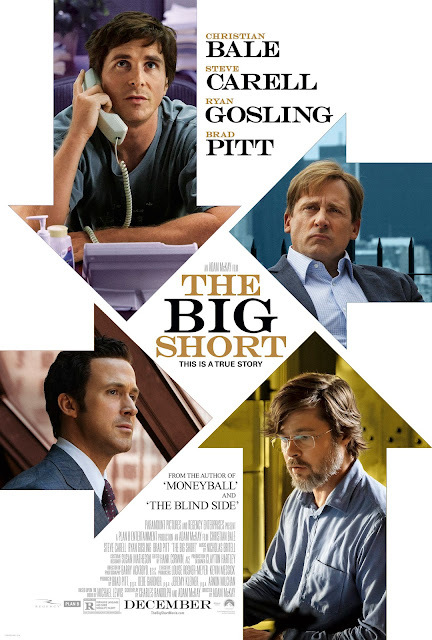 Gosling plays Jared Vennett, an investor who hears of actions made by Michael Burry (played by Christian Bale). Burry, a hedge fund manager who suffers from blindness in one eye & also suffers from Asperger's syndrome, discovers that the US housing market is extremely unstable, & decides to "short" (to bet against) the housing market. He talks with many banks about this, & the banks accept his proposal, believing that the housing market will not fail. He predicts the collapse will occur sometime in the second quarter of 2007. Some investors get anxious & try to withdraw their investments, but Burry holds off all withdrawals. However, just as he predicted, the market collapses, & he ends up posting profits of 489%. While Burry was waiting for the market to collapse, Vennett, realizing Burry's predictions are true, puts his own stake in the plan. An accidental call alerts Mark Baum (played by Steve Carell) of the plan & joins Vennett. After visiting the American Securities Forum in Las Vegas, Baum realizes that the entire economy will collapse. He is eventually convinced to go through with the plan, making a big profit from the situation. While that was going on, Charlie Geller (played by John Magaro) & Jamie Shipley (played by Finn Wittrock) get involved in Vennett's plan; however, since they are too inexperienced to pull off deals necessary to make a profit from the situation, they enlist retired banker Ben Rickert (played by Brad Pitt) to help them out. After the deals are made, Geller & Shipley are initially ecstatic about the profits, but Rickert reminds them that they are profiting from a collapse of the economy in which people will lose their jobs & their homes, much to his chagrin & their sadness. While they do make an immense profit, they no longer have as much faith in the system as they once did. It is stated in an epilogue that Burry now only invests in water (& he also wanted to talk about how he knew this would happen, but he never did, as he was audited by the FBI 4 times), Baum continues his career, never gloating about his prior knowledge, Rickert goes back to retirement, & Geller & Shipley unsuccessfully sue the ratings companies & eventually split apart. None of the people who caused the collapse are arrested. The acting was excellent, the direction from Adam McKay was excellent (considering this is a departure from his other films: Anchorman, Step Brothers, & Talladega Nights), & the screenplay by Adam McKay & Charles Randolph was amazing. The editing was also extremely well-done. This is definitely the best film of the year.